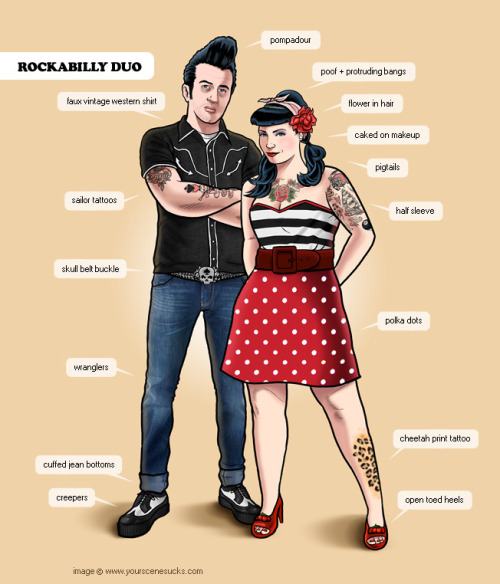 Rockabilly Girls....What do we wear? Whether you follow high fashion, or an alternative fashion, the majority of us do actually stick to some sort of fashion rules. We may pick and mix from a few, changing which set of rules we follow that day, but it is rare to meet anyone who literally follows no rules at all. You want a strong and definite colour. Rockabilly girls aren't shy. Black, white blonde, and bright red are all very classic rockabilly /pin-up hair colours. And you can maintain them at home as they are all block colour tones. No highlighting needed here! Once you have your hair colour....now you need to style it! You could opt for the classic bettie bangs - a short u-shaped fringe. This can be cut, or faked (roll hair into a pretend bang). There are the options of victory rolls, bee-hives, bandanas, or curled and brushed out to a vintage wave. The pomp' is also an easy every day look - if you don't go for the fringe. You can use a variety of hair accessories - a bandana, a hair flower, or bows. Items to consider - Pencil skirts, Swing Skirts, Cropped Trousers, Short Sleeved Shirts, Sarong Dresses and Halter Necked Tops and Dresses. Colours to choose from - Red, Black, White, Navy. Patterns to get - Polka Dots, Stripes, Gingham (checked), Leopard Print, and Tartan. Motifs to embrace - Cherries, Swallows, Skulls, Anchors, Horse Shoes, Dice, Bows and Pin-Up Girls. You can buy Rockabilly Fashion from all of these awesome rockabilly shops online or even some rockabilly on the high street.